Guild Name is the name of a guild. 1 Why Guild Name guild? 2 How does Guild Name guild help me? 3 How do I help Guild Name guild? Have you ever looked at the guild list and wondered, "Which guild should I join?" We have all wondered that too! Have you ever thought, "Does it really matter which guild I join?" Did you ever ponder, "Why are many guilds taking this alignment thing seriously even though it doesn't seem to affect the game at all?" Have you ever wondered, "What's the use of devoting my time to a guild in a parody?" We like to think that we are the default guild in Godville, as every time we ask someone how to join a guild, they answer join "Guild Name" guild. and start your quest for mediocrity! How does Guild Name guild help me? The Guild Name guild will show up in the Hero section of the Hero and Superhero pages, providing you two-click access to this page and three-click access to the Forum Headquarters, helping to save the environment by reducing clicks and page loads. How do I help Guild Name guild? As a new member to Guild Name, you may wonder what you can do to help the guild. 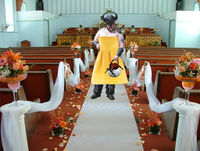 According to Guilds, the best way to help us is to encourage or punish your character when your character is in a town. This will increase our guild's influence in the town, helping to spread our desire to be average to the rest of the Godville universe. Don't forget!-the act of influencing in towns is not only an altruistic one-after you have influenced a bit, you will start to get free bold and activatable items when you get to the towns you influenced in. Thus you can help yourself by helping us as well! Also, if you notice your character trying to join a different guild, you can always cancel it and stay with us, as it's almost guaranteed any other guild won't be as average as ours. Just send the command "cancel quest" to your hero or heroine until he or she listens. To increase our visibility, you can also put a reference to *Guild Name* guild in your motto if you want, but please feel free not to as well-Guild Name appreciates individuality. Feel free to add any of our guild members or founders as friends, and we will be moderately happy to answer any questions we can. It also helps to increase guild unity (not Unity) if members befriend other members. The members of Guild Name feel that the following rules could be followed if you want, but don't stress. Thou shalt treat all other heroes and guilds with at least a modicum of respect-Guild Name officially has no enemies from our side, although if other guilds or heroes want to dislike us, it's cool, we understand. Thou shalt not worry about anything that is not actually that important when thou steppst back and considerst it thoughtfully. With the advent of the Guild Council chat available to all members at the follower level or above, we decided it would be sufficiently proactive to come up with a list of rules for the usage of the chat, as well as guidelines for members in how to deal with breakers of these rules. Thou shalt please keep the Guild Name guild council forum a light-hearted, fun place to chat for all. Thou shalt take this to mean no insulting, profanity, personal attacks, or anything else that makes thou look like thou art not making the guild council forum a light-hearted, fun place to chat. Thou shalt realize that about 300 people have the ability to read thy posts, so thou shalt please not ask others for personal information, carry private conversations, or write things not directed at these 300 people. Thou shalt attempt to avoid asking people to vote for thy ideabox submissions by name, as Guild Name officially promotes fairness in voting. Asking the council to check the ideabox because thou mayest have an idea in it is acceptable. A. Breaking #1 above is grounds for expulsion immediately, or maybe just a warning depending on severity. B. Breaking #2 above could get thee a warning. C. If thou getst a warning, feel free to explain thyself. If thou continuest to do what got thee the warning, thou could get expelled if it’s bad enough, or another warning, then thou shalt goto guideline C.
D. Thou mayest contact Epoch 庙畜 to explain thyself if thou hast been expelled. Thou shalt please try to understand why thou werest expelled-showing that thou realizest what thou hast wrought will help thee get back in. E. If thou hast been expelled twice, thou canst still apologize and try to get back in, but please understand we will be a bit nervous, which is no fun for anyone, especially Epoch 庙畜, who will look like a moron for letting thee back in the first time. It has been noted in the forum that occasionally Guild Name members will be granted "Guild Points" by one of the founders. Guild Points are like those tickets you get from prize machines in that eventually huge numbers of them will be able to be turned in for mostly worthless prizes. In the meantime, Guild Points are tracked here so that those who are collecting them receive the moderate quantity of fame and subdued admiration that they deserve. Guild Name founders are unable to receive Guild Points ever since two of them (we're not naming names) went on a Guild Points-fueled binge and ended up in the Beerburgh prison overnight. Then another founder (again, not naming names) had to try and get his hero to go to Beerburgh and bail them out, and the hero wouldn't listen and ended up in Anville. It was a mess. On Day 409 g.e., Guild Name had the closest thing to a constitutional crisis, as it was noticed that one person with Guild Points is no longer in Guild Name. We determined quickly and with utmost agility that it is actually totally fine for people who are not in Guild Name to get Guild points, we just have to restrict the rules a bit. As such, anyone in Godville can receive Guild Name guild points, but is not eligible under rules 1, 5, and 7, because that would just be silly. We have added a Guild column to the table. It must be noted that prizes for Guild Points are also available for non Guild Name members, but they will be Guild Name themed. Crisis averted, and in a Guild Name-consistent manner! Posting a successful town influence by private messaging Epoch 庙畜 or Rugby Jesus 庙畜 with the information-if you have not friended either of them yet, you can post it in the forum, but there is enough going on in the forum now that influence messages tend to clutter it up. Recruiting a friend into Guild Name and having them post in the forums that you recruited them. ^ Guild Points are handed out randomly at the discretion of the Guild Name's elected leader. ^^ Guild Points pantheons are retired. Points may still be handed out but no longer count toward Mediocrity Standings under the assumption that everyone is perfectly mediocre the way they are. Please visit the Guild Points list to see and appreciate all the members who have given their GP for the rest of the group. Note: when a member hits 100 points, they will be considered to have reached the achievements "helped enough" and "not worth the effort to continue tracking". They will then receive a place on Guild Name's mini-pantheon of Mediocrity, notified by the phrase "too many" and their rank in said pantheon in parentheses. Until a member takes his or her rightful place on the pantheon, you can find them in the Guild Point leaderboard, which is very long and scrolling through it is a lot of effort. Your Ex Girlfriend 庙畜 Strapping Lad Guild Name too many(1) Boerenkaas Komijnekaas 510 g.e. Dumhed 庙 Dumbut Guild Name too many(2) Toe X 525 g.e. Shmoozo 庙 Smort - 42 Guild Name too many(3) Venissimo X 547 g.e. Benign Neglect 庙畜 Who Ru Guild Name too many(4) Double Gloucester 554 g.e. Egotrip  Dirty Durden Guild Name too many(5) Järlsberg X 566 g.e. Charona  Brendina Guild Name too many(6) Potkäse Guild Name for Gory 587 g.e. Fumanchu888 庙 Fuquay Guild Name too many(7) 602 g.e. She-La 庙畜 Shangri Man Guild Name too many (8) X 619 g.e. MTKnife 庙畜 Theora Guild Name too many(9)* Chocolate Cheesecake X 621 g.e. Zonytarro  Foolpitier Guild Name too many(10) Pecorino Romano X 622 g.e. LisaAlexandra 庙 LisaAlexandra Guild Name too many(11) Squeaky X 638 g.e. Bucch 庙 Dante Hicks Guild Name too many(12) X 646 g.e. Belgaleen 庙畜 Giada Lamour Guild Name too many(13) X 649 g.e. Boma 庙畜 Rinoa Heartilly Guild Name too many(14) X 672 g.e. Tarsius 庙畜 Marion Rossenbach Guild Name too many(15) No Access to Cheese X 679 g.e. Xzzwxs 庙畜 Post-it Guild Name too many(16) Burduf X 704 g.e. Morrigan Dahlia 庙畜 Olav Asveinn Guild Name too many(17) X 709 g.e. Boyack  Daltrey Guild Name too many(18) X 716 g.e. Mygame 庙畜 Mychal Guild Name too many(19) 720 g.e. AdamShi 庙畜 Agon Kaldar Guild Name too many(20) X 723 g.e. J Zezel 庙畜 Hathorne Guild Name too many(21) Gruyere 736 g.e. Knossos 庙 Akilleze Guild Name too many(22) Gouda 761 g.e. PadmeLupin 庙畜 Lady Q Guild Name too many(23) X 766 g.e. Prosnoopy 庙畜 Tribbles Guild Name too many(24) Blue Cheese & Pepper Jack, Hogs Head Cheese X 781 g.e. Bogardan  Nollito Guild Name too many(25) Moon Cheese X 782 g.e. Chamelaeon 庙畜 Potatocat Guild Name too many(26) Parrano (Aged Gouda) X 820 g.e. Musselini 庙畜 Cooper Dog Guild Name too many(27) 837 g.e. MasterOfShadows 庙 Mychlon Guild Name too many(28) Emmentaler X 853 g.e. DrOg 庙畜 Carakticus Guild Name too many(29) X 860 g.e. Raseac  Dellmaker Guild Name too many(30) X 868 g.e. Kons 庙畜 Konstant Guild Name too many(31) Ricotta X 874 g.e. Goram 庙畜 Dayr Guild Name too many(32) String cheese X 883 g.e. Cryshoff 庙畜 Jay the Stubborn Guild Name too many(33) X 952 g.e. Hovah 庙畜 JinAlbany Guild Name too many(34) X 958 g.e. P31 庙 Mary31 Guild Name too many(35) 973 g.e. JamieShi 庙畜 Mitsy Guild Name too many(36) 973 g.e. Sundown 庙 Gabryhl Guild Name too many(37) X 976 g.e. Vidiae 庙畜 Danglars Guild Name too many(38) Asiago 1014 g.e. Shizzledizzle 庙 Captain Shizz Guild Name too many(39) Tillamook White Cheddar X 1034 g.e. Alielle 庙 Miss Inga Shoe Guild Name too many(40) X 1108 g.e. Stefan Alvarado 庙 Braff Guild Name too many(41) X 1132 g.e. Quetiapine 庙 Eskalith Guild Name too many(42) X 1140 g.e. Vykandes 庙 Karal Guild Name too many(43) Smoked Swiss and Horseradish Cheese 1214 g.e. The legends say that Guild Name was formed at lunch. It was actually formed in the 10 minutes after lunch, as the founders headed back to their "offices" to do "work". This date is generally placed around day 340 g.e. It then took another day before the guild founders' heroes finished their quests, making the founding date day 341 g.e. 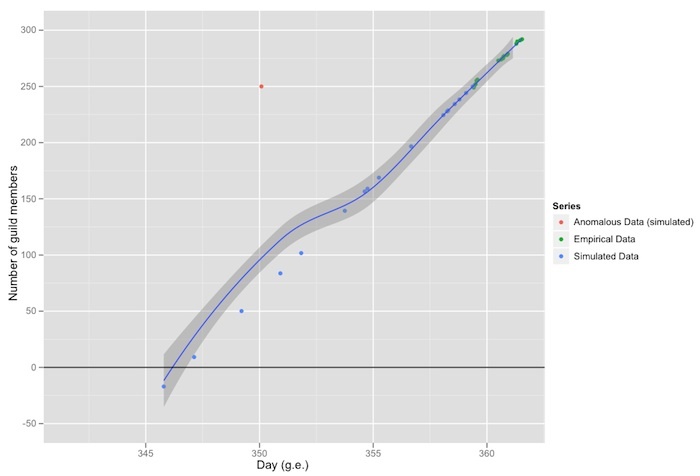 However, using archaeological evidence and extrapolated data based on guild growth rates between day 359 g.e. and day 361 g.e. and assuming a linear regression, the number of members on day 341 g.e. would be -101.35, making the guild founding date day 346 g.e. based on a growth of 0.8187 members per hour. Archaelogical evidence is necessary based on the numbers, because numbers never lie. Are the fallible memories of the founders really more reliable? There are legends of members who joined before day 346 g.e., such as anyone who has a guild rank that would require more days. This evidence is being considered, but as it conflicts with the very complicated mathematical simulation of the linear regression, either foul play or divine intervention is assumed. This period, from founding day (whenever that was) until day 362 g.e., is known as the "Climb to Irrelevance". 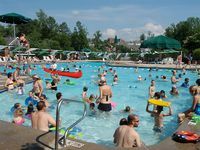 Then came "the Dip", the era where Godville's Unity calculation decided we were too large and started to cut members it did not consider appropriate. From these 321 members, Holy Random culled 75 members, bringing us down to our second low point on day 372 g.e., approximately 246 members. As of this point, Holy Random considered Guild Name's sacrifice to be enough, and began to grant us new members. On day 374 g.e., we were up to 256, suggesting the next age dawned then. This age came to be known as the "Age of Uncertainty", as over this period, Guild Name's Unity and number of members rose very quickly again, but then fluctuated slightly up and down (between two and three percent) every day. This age has the distinction of being when Guild Name started to gain a foothold in the towns. The townspeople sensed these relative newcomers as non-threatening, and unlike most political figures, the Guild Name members did not promise the world, but they did pay their bills on time, they never talked at the theater, and they never were that jerk who left the pub early leaving friends to pay for all the drinks. However, the "Age of Uncertainty" included the fact that the town influence shifted almost daily as well. This age also included the period where Guild Name dubbed its first chief masters, a title unbecoming of Guild Name's core democratic values. The paperwork has been prepared to make everyone chief masters, but we're just not sure to whom we should send it. Guild Name had become a mainstay in the ranks of Godville guilds. The guild showed a consistent improvement in town influence, even making it to number 5 on the List of Guild Influences for a short time (due to a glitch in the influence calculation), but settling around place 6 consistently. Guild Name became more and more respected among other guilds, as the guild concept was non-threatening and the guild members spread the joy of being middle-of-the-road throughout the lands. Other guilds began to adapt some of Guild Name's ideas, and the guild became accepted as a Godville mainstay. This age was dubbed "the Concrete Age", due to its steadiness, stability, heavy weight, grey color, and relative affordability. During "the Concrete Age", Guild Name dubbed its first Advisors, suggesting achieving new ranks to be a convenient way to signify beginnings of new ages in the future. "The Concrete Age" thus began on day 401 g.e. Guild Name still feels slightly uncomfortable about such differentiating and classification as ranks being ascribed to its members, as it just seems a lot of work, but doesn't really feel strongly enough to complain too openly. Administrator”, is being exhibited at the Beerburgh museum. to join a psychedelic study group. Positive implications are guaranteed. From this, it can be inferred that Guild Name is into writing letters, does not have a negative view of authority, is inclusive, and tends to be active on weekends. It is also of note that by day 412 g.e. in the Godville universe, writing letters is so uncommon as to evoke enough emotion to not only make a tapestry, but also have this tapestry considered epic enough to be categorized "breaking news". 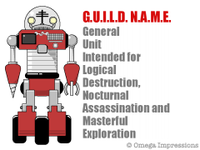 Guild Name had established itself as one of the six most influential guilds in Godville, and this without trying to fight any wars or make any enemies. The fourth age began around day 431 g.e., when Guild Name's first few members became Grand Masters. 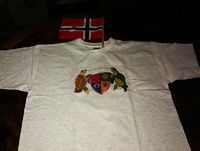 This era was signified by the printing of the first official Guild Name t-shirt, viewable in our gallery below. The recipient, Egotrip , will forever be known as the first person to actually get something out of Godville in real life. The era was also signified by Knossos 庙's four-pack, Shmoozo 庙's Alpenhörner, the 1000th post on the forum thread (also by Shmoozo 庙), and the implementation of the Third Eye. It was known as the Era of Participation due to the large number of participatory events that occurred during this period, and due to the members' superlative ability to participate with the best of them. is a huge fan of Deville’s pubs. We are especially proud of her perfectly adequate motto, as well as her progress as a gladiator! Another participatory event in the Era of Participation was Guild Name's first father/son members to participate, Roosta and Arkevon . Guild Name members also participated in liking cheese and classic video games. 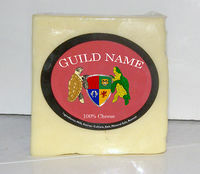 As the dawning of a new era approached, the liking of cheese and the totally unrelated event of the Cheesemonster shedding his secret identity created a sort of dilemma-the Guild Name members knew that they must come up with new criteria for the changing of an age soon, as founders' ranks would soon change very rarely as they grew high enough. To test this out, the last three weeks of the Era of Participation were dubbed "The Aged of Cheese". During this time, Guild Name attempted to land on the moon (which ended in near-disaster when someone drank all the rocket fuel and the astronaut went missing at the same time - coincidence?). 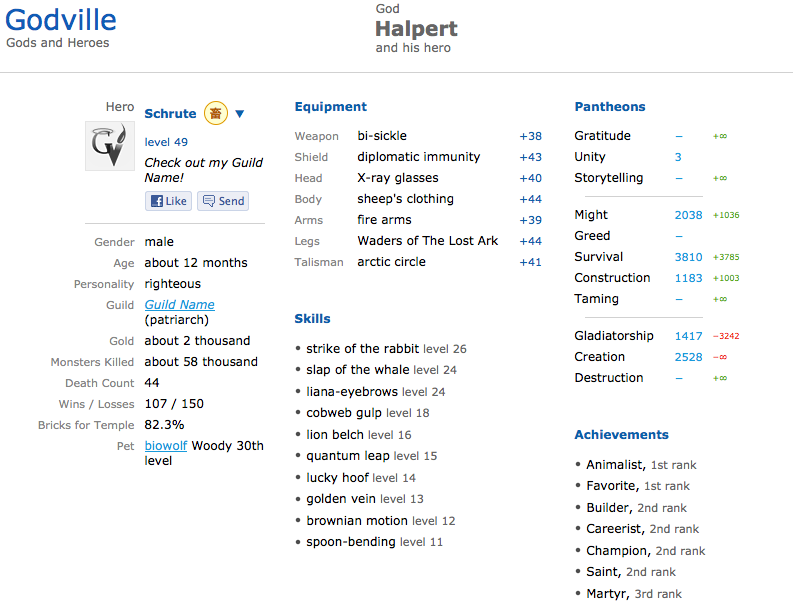 The whole guild went a bit cheese-crazy, signs of which still litter the Guild Points table. Founder Queue being #2 and Founder Epoch 庙畜 being #5 in the Storytellers pantheon on the opening day, day 471 g.e. 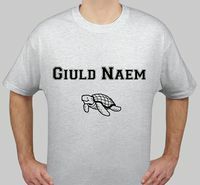 Guild Name founders had become mainstays on the Storytellers pantheon, leading to the suggestion of the new era being themed on this. Member Kyle Weiss reached #1 in Storytelling on day 504 g.e., member MTKnife 庙畜 reached #1 on days 511-518 and after that many other days as his chronicles were simply the best Godville had ever seen, and member Karen Hickey 庙畜 hit #1 on day 521 g.e. Member Your Ex Girlfriend 庙畜 became the first Guild Name member to receive 100 Guild Points, causing the founders to declare they are too lazy to count points over 100 and sparking the creation of the Pantheon of Mediocrity, Godville's first guild-specific pantheon. stands at the 8th position in the pantheon of creation under the vigilant supervision of the goddess Karen Hickey. She is a huge fan of Tradeburg’s pubs. reports that a Godvilla has been afraid to make eye contact with him since their last encounter. Astrologers from the “Guild Name” guild reassure us that the future is almost here. From this, we can infer that Guild Name has astrologers, and like all astrologers, they take cues from someone's behavior to make a statement that may seem eerily true, but is at best an educated guess when one thinks about it. Like Guild Name's meteorologists. stands at the 19th position in the pantheon of storytellers under the vigilant supervision of the god Xzzwxs. His dream is to master the “somersault squatting” skill and then offer lessons in exchange for gold bricks. Dumhed 庙 has two words with, you guessed it, 3 spaces each! Gold fund has been around 30000, which is enough gold to build 30 temples. 3+0=3! As the Third Age dawned, Xzzwxs 庙畜’s hero chose to promote Guild Name thrice in rapid succession while in Godville. Perhaps you can find other eerie coincidences during the Third Age? The Third Age also was signified by the first time Guild Name reached #1 in the Pantheon of Arbitrary Mathematics, a.k.a. the Pantheon of Unity. As 1 is 30, this is thus consistent with the age, and it can be then posited with every age. Although we're not putting too much pressure on ourselves. During the Third Age, Guild Name got its second, third(! ), fourth, and fifth temples, from Epoch 庙畜, Your Ex Girlfriend 庙畜, Dumhed 庙, and Benign Neglect 庙畜. Their temples, although not the most grandiose or well-visited in the land, at least had toilets that worked and didn't charge an entrance fee, instead relying simply on donations. They were not surrounded by pools of poison or anything else so evocative, but instead were built near a pleasant trout stream. LisaAlexandra. She is deeply gratified by her place in the pantheon and is not planning to give it up any time soon. someone to reach the unreachable and report the results via express mail. dream is to master the “forced generosity” skill and then offer lessons in exchange for gold bricks. ever wanted was a little love and affection. stands at the 15th position in the pantheon of storytellers under the vigilant supervision of the god Rugby Jesus. All he ever wanted was a little love and affection. stands at the 1st position in the pantheon of storytellers under the vigilant supervision of the god MTKnife. Her dream is to master the “homesickness” skill and then offer lessons in exchange for gold bricks. and then offer lessons in exchange for gold bricks. trophy – something that looks like blood diamond. He is also a huge fan of Los Adminos’s pubs. for danger, and an incredibly high pain threshold caused by repeated exposure to blunt objects. skill and then offer lessons in exchange for gold bricks. exhausted comrades with his laughter. supervision of the god Epoch. He was known to distribute counterfeit Godville invites during his youth. Starting around day 641 g.e., Guild Name entered a new era. This era was signified by Guild Name's voice cracking, some awkward pimples, and unfortunate odors, but a budding sense of potential and promise, and a setting like that of the middle part of a teen movie. Guild Name members had started to make their mark on the greater Godville community by participating in other guilds' threads. Several members assisted with the inital stages of Skeatseria Lodge's pantheons of debauchery, for example, as they began to experience what life as a member of an adult guild was like. Guild Name members also became cardinals with amazing alacrity, helping to keep Guild Name at #2 in the Unity Pantheon for an alarmingly long time. This made us all wonder if the pantheon was broken. This was not without growing pains, however. Guild Name had another crisis-that of receiving the keys to a brand new Guild Council, but having to figure out how to deal with the responsibility contained therein. Members devised Godville's first formal, public Guild Council rule list to attempt to prove their commitment and sense of duty, hoping that they would be shown worthy and possibly be allowed to take the Guild Council out on Saturday night. honorable mention in the form of this newspaper notice. The guild was flattered that it was noticed for what it is, and is still convincing itself that it is original. supervision of the god Dumhed . He was known to distribute counterfeit Godville invites during his youth. 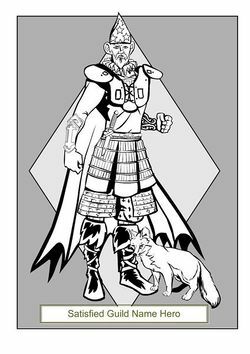 hero has no distinctive features to date; however, he promises to get some before his next appearance. goddess Your Ex Girlfriend. All he ever wanted was a little love and affection. stands at the 42nd position in the pantheon of storytellers under the vigilant supervision of the god Xzzwxs. We've had many reports that an Autophobic Recluse has been afraid to make eye contact with him since their last encounter. stands at the 63rd position in the pantheon of survival under the vigilant supervision of the god Belgaleen. Rumor has it that a local Double Dragon has learned to show the heroine proper respect for some reason. She Who Meditates. She is a huge fan of Unspecifiedistan’s pubs. counterfeit Godville invites during his youth. Epoch. All he ever wanted was a little love and affection. scarlet letter. He is also a huge fan of San Satanos’s pubs. is a huge fan of Unspecifiedistan’s pubs. caused by repeated exposure to blunt objects. goddess Your Ex Girlfriend. He was known to distribute counterfeit Godville invites during his youth. Guild Name temples were being built fast and furious, but not like the movie series, so maybe steadily and on-schedule, and Guild Name pets were gaining levels, which seems to actually be irrelevant to how the pet behaves. 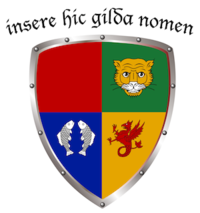 Guild Name founders became regents on day 792 g.e., marking the beginning of a new age. This age has come to be known as <INSERT AGE NAME HERE>, as it was famous for <ACCOMPLISHMENTS OF AGE>. <NUMBER> simultaneous 100-brick-countdowns through much of the age caused Guild Name to question if 100 bricks was the correct amount to have a countdown for. Guild Name's first three-temple 24-hour period, starting on day 837 g.e. Guild Name's first four-temple 24-hour period, starting on day 844 g.e. it that a local Schrödinger’s Cat has learned to show the hero proper respect for some reason. he ever wanted was a little love and affection. that a Tripodal Spider slow roasted in its own juices is one of the finest delicacies that Herolympus has to offer. fan of Los Adminos’s pubs. features: a reckless disregard for danger, and an incredibly high pain threshold caused by repeated exposure to blunt objects. A honored ER frequenter Your Ex Girlfriend claims that improving ideas is not really painful. report the results via carrier pigeon. smile and ability to wake even the most exhausted comrades with her laughter. Guild Name's founders, those that remain, had reached the level of prophet, signifying that either the guild needs to come up with some new indicator of what starts a new age or Godville needs to add a new rank, as we've now run the gamut. Kons 庙畜 finally having the game recognize him for raising a pet to level 30, a heffalump named Tige. We will keep honoring his first pet on this page, however. His pet badge number is 75, however, because we forgot to number the other one. Sergiolo 庙 finishing Guild Name temple 200! roasted in its own juices is one of the finest delicacies that Monsterdam has to offer. Golem has learned to show the heroine proper respect for some reason. Dyna Mite has been afraid to make eye contact with her since their last encounter. own juices is one of the finest delicacies that Godvillewood has to offer. find out what the birds and bees are actually up to, but never found the time. Heart Attacker has been afraid to make eye contact with him since their last encounter. position in the pantheon of gratitude under the vigilant supervision of the god Xzzwxs. All he ever wanted was a little love and affection. Mathlete has been afraid to make eye contact with her since their last encounter. and is not planning to give it up any time soon. with him since their last encounter. and an incredibly high pain threshold caused by repeated exposure to blunt objects. one of the finest delicacies that Los Demonos has to offer. lessons in exchange for gold bricks. show the hero proper respect for some reason. is one of the finest delicacies that Unspecifiedistan has to offer. pantheon of mastery under the vigilant supervision of the god Benign Neglect. All he ever wanted was a little love and affection. ability to wake even the most exhausted comrades with her laughter. to show the hero proper respect for some reason. then offer lessons in exchange for gold bricks. local Trans Fat Cat has learned to show the hero proper respect for some reason. someone to break off a deal with the devil and report the results via express mail. has it that a local Bear-Faced Liar has learned to show the hero proper respect for some reason. stands at the 50th position in the pantheon of savings under the vigilant supervision of the goddess Your Ex Girlfriend. He’s asking someone to discover the atomic number of the element of surprise and report the results via express mail. no distinctive features to date; however, he promises to get some before his next appearance. to ask the right questions and get the right answers, but never found the time. is known for his disarming smile and ability to wake even the most exhausted comrades with his laughter. Guild Name member Nucular made the paper on day 1305 g.e. also a huge fan of Herowin’s pubs. it that a local Tiger Lily has learned to show the hero proper respect for some reason. Guild Name had settled into a happy, moderate existence, as the prophecy and the psychohistory foretold. It was a sort of Pax Guildana, if you will. Dungeons were being solved at a record pace, level-up scrolls abounded, and pets were aging far beyond their natural lifespans. This was all too easy, right? Or was it? On day 1493 g.e., the powers-that-be decided that Guild Name, along with the rest of the guilds in Godville, were becoming too complacent. Even though the official line on guilds had always been that Godville is different and that there are no guild leaders, apparently all's fair in love and ZPGs (which are getting less and less Z). An election system was introduced to provide the guilds with yet another ground for infighting. Guild Name wondered what the point of it all was. But as usual in Godville, this was up for Guild Science to figure out. And as it turns out, being a guild leader means getting access to a new page with the ability to make a couple minor changes, like electing a totem monster (whatever that means), as well as to create a new high rank requiring more than two years to reach. As always, Guild Name weathered election season in a relaxed manner, and the last active founder, Epoch 庙畜, was easily elected. But that's where the challenge began. What should the "totem" be? What should the rank be? These questions provided incessant fodder for hilarity in the Guild Council, with opinions divided on whether to act swiftly and decisively, or to be careful and methodical. It seemed however that the Guild Name spirit won out, and the members of Guild Name were just not bothered with deciding, as that would take too much work. It was unclear at this point what kind of monster would be allowed as a "totem", as Godville had expressed a pretty severe list of restrictions to the set of eligible "totems". So Guild Name chose a few monsters consistent with the Guild Name spirit, as well as a few GN-specific monsters, and Epoch 庙畜 decided to let the spirit of Guild Name flow through his fingers and just try them in the order they were suggested. The list was Generic Enemy, Mediogre, Autoexec Bat, and Prancing Pony. Generic Enemy worked the first time, so that's that. These were under discussion for some time, but no clear favorite was found. Cries came from the ranks for the leader, if he did exist and was able to act decisively, to decide, and with this decision, set the guild free of the pressure of having to decide. The rank of "member" was chosen. Let it be written, so let it be done. 52 members of Guild Name were honored at the beginning, with Khemul 庙畜 being the first to ascend to the rank afterward. And with these decisions made, Guild Name returned to important business, like trying to expel the newest member of the Guild Council, the suspicious but exceptionally generically named Guildbot. They also began construction work, or in reality, construction imagination, on the Member Ship. It's a ship for members. Captain Morgan served in a Manhattan style, using dry vermouth, with a thin line of Grand Marnier floated on top. According to this graph and science, in 6 years we will have over 40,000 members. And many more. Our chief guild scientists, AdamShi 庙畜, CRogers 庙畜, and Xzzwxs 庙, have worked with Epoch 庙畜, many Guild Name members, and many friends and acquaintances from other guilds. We're still trying to figure out how publishing research works in Godville, but we are all willing to share any knowledge we have discovered with anyone who asks, Guild Name or otherwise. Please contact any of us if you would like to know more. 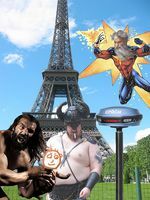 The Guild Name Guild Gallery is a place where member submitted photos of the gods or heroes can be displayed for the moderate enjoyment of all. It shows that both the gods and heroes have a wide range of interests outside of simple monster slaying and forum posting. Guild images such as crest versions, guild points, failed T-Shirt prints, and other miscellany will also be displayed here for posterity. A satisfied Guild Name Hero and his trusty firefox "Pet Name"
Egotrip 's Guild Name t-shirt-he was the first to 50 Guild Points! Which other guild has official glassware? This page was last edited on 3 February 2019, at 11:11.